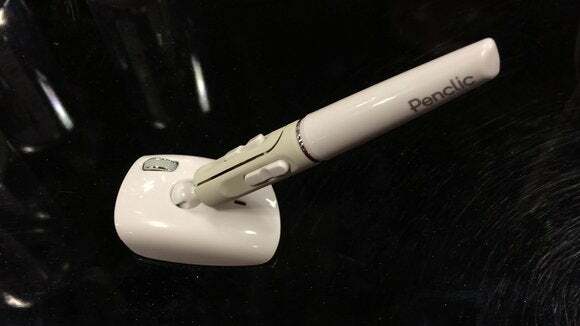 When I first saw the Penclic Mouse from a short distance from Prestige’s Macworld/iWorld booth, I thought, “Why is someone selling those pens and pen holders you find at banks?” But upon closer inspection, I realized that the Penclic Mouse is an input device that uses a mounted stylus. The Penclic Mouse is held like a pen, which may be a more comfortable grip for some people than a typical mouse. You don’t use it like you would a stylus on a tablet, however; the Penclic Mouse’s base has a sensor underneath, so you move the whole device on your desk. The device has five buttons, a scroll wheel (that’s oddly located on the base, not on the pen), and a switch for changing between 800, 1200, and 2400 dpi. A Bluetooth version is available for $99, while a wired version is $70. Prestige didn’t have the Penclic Mouse set up with a computer, so I couldn’t give it a true test drive. I doubt it can replace my trusty Logitech Performance Mouse MX, but then again, I don’t have ergonomic issues, and the Penclic Mouse could be a viable device for anyone who has problems using a traditional mouse.